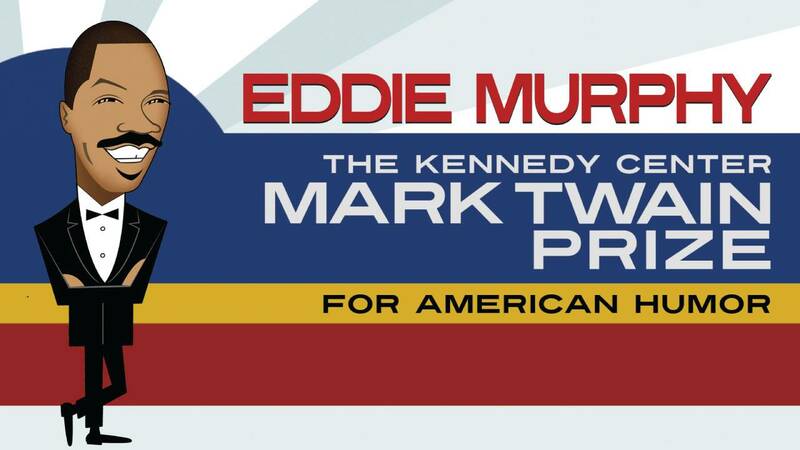 This October, The Kennedy Center Mark Twain Prizesalutes Eddie Murphy. Taped at The John F. Kennedy Center for the Performing Arts on October 18, the special features a star-studded cast of Murphy’s friends and colleagues including top entertainers and comedians, Dave Chapelle, Kathy Griffin, Arsenio Hall, Brittany Howard, George Lopez, Sam Moore, Tracy Morgan, Kevin Nealon, Trevor Noah, Jay Pharoah, Joe Piscopo and Chris Rock. The evening pays tribute to the humor and accomplishments of the comedy icon. Eddie Murphy is the most commercially successful African-American actor in the history of the motion picture business, and is one of the industry’s top-five box-office performers overall. Murphy is on the very short list of actors who have starred in multiple $100 million pictures over the past three decades, from Beverly Hills Cop to Daddy Day Care. He is also the voice of Donkey in the Oscar®-winning animated film Shrek and its sequel, Shrek 2, which is the top-grossing animated film of all time. Murphy won an Annie Award and earned BAFTA and MTV Movie Award nominations for his performance in the first Shrek, and reprised the role of Donkey in the final installment of the hugely successful franchise, Shrek Goes Fourth. Murphy began his career as a stand-up comedian 25 years ago. In 1980, at the age of 19, he joined the cast of Saturday Night Live, and has since gone on to establish a successful career on the big screen. His films have been among the highest-grossing comedies in the industry, including 48 Hrs., Trading Places, Dr. Dolittle, Coming to America and the Beverly Hills Cop franchise. Murphy garnered Golden Globe Award nominations for Best Actor in a Comedy for his performances in Beverly Hills Cop, Trading Places and 48 Hrs. In 1989, Murphy made his directorial debut with Harlem Nights, a period comedy he also wrote and starred in, opposite Richard Pryor and Redd Foxx. In addition, Murphy starred in and produced the hit comedy Life co-starring Martin Lawrence, and starred opposite Steve Martin in the comedy Bowfinger. He was also the voice of Mushu the Dragon in the successful animated epic Mulan. In 2007, Murphy received rave reviews and critical acclaim for his portrayal of James “Thunder” Early in the Dreamworks film Dreamgirls, a performance which would garner him the Golden Globe, Screen Actors Guild and Broadcast Film Critics Association Awards for Best Supporting Actor in a Motion Picture as well as earning him his first Academy Award nomination in the same category. Eddie Murphy is the 18th recipient of The Kennedy Center Mark Twain Prize for American Humor. Past recipients of the prize have been Richard Pryor (1998), Jonathan Winters (1999), Carl Reiner (2000), Whoopi Goldberg (2001), Bob Newhart (2002), Lily Tomlin (2003), Lorne Michaels (2004), Steve Martin (2005), Neil Simon (2006), Billy Crystal (2007), George Carlin (2008), Bill Cosby (2009), Tina Fey (2010), Will Ferrell (2011), Ellen DeGeneres (2012), Carol Burnett (2013) and Jay Leno (2014).